I mentioned the 'mantra' being reinforced in May and now it is public. Rome is not willing to accept us as we are. This does clear things up though - especially the part about the SSPX needed to accept the 1988 profession of faith. I believe that the 'Resistance' claimed that the SSPX was going to accept that bit. I guess that was just conjecture. 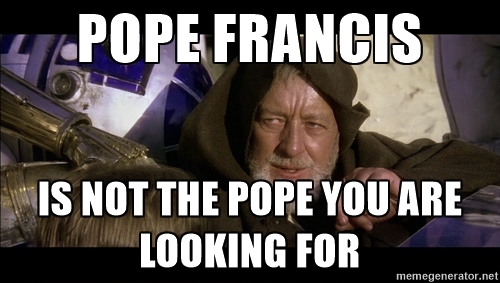 Eventually, either Pope Francis will change, die or 'retire'. Then the next Pope will have his chance to examine the issues with the Second Vatican Council, the New Mass, Pope Francis etc. Through all this we can arrive at one safe conclusion: The SSPX has not compromised. Last weekend, as rumors swirled of Cardinal Müller's imminent dismissal from his post as Prefect of the CDF, the French website Medias-Presse.Info published what it claimed to be an excerpt from an important letter sent by the Cardinal to Bishop Bernard Fellay regarding the conditions for an accord between the Vatican and the SSPX. Today the Remnant published an English translation of this excerpt; we reproduce the entire Remnant article below, followed by a note on the 1988 Professio Fidei mentioned in it. Rorate's own sources have confirmed the authenticity of this text. From www.medias-presse.info comes the following excerpt of a letter from Cardinal Müller to Bishop Bernard Fellay. According to www.medias-presse.info, Cardinal Müller's letter was communicated to all SSPX members by the SSPX General House. “The Society of Saint Pius X does not seek primarily a canonical recognition, to which it has a right because it is Catholic. The solution is not simply juridical. It pertains to a doctrinal position which it is imperative to manifest [...] Divine Providence will not abandon Its Church whose head is the Pope, Vicar of Jesus Christ. That is why an incontestable sign of this restoration will reside in the signified will of the Sovereign Pontiff to grant the means for re-establishing the order of the Priesthood, the Faith and Tradition – a sign which will be, furthermore, the guarantor of the necessary unity of the family of Tradition”. The Professio Fidei of 1988 refers to the Professio fidei et Iusiurandum fidelitatis in suscipiendo officio nomine Ecclesiae exercendo (Formula to be used for the profession of faith and for the oath of fidelity to assume an office to be exercised in the name of the Church) dated July 1, 1988 (coincidentally the day after the 1988 episcopal consecrations in Ecône) and published in the Acta Apostolica Sedis in 1989.
born of the Father before all ages. God from God, Light from Light, true God from true God, begotten, not made, consubstantial with the Father; through him all things were made. For us men and for our salvation he came down from heaven, and by the Holy Spirit was incarnate of the Virgin Mary, and became man. For our sake he was crucified under Pontius Pilate, he suffered death and was buried, and rose again on the third day in accordance with the Scriptures. He ascended into heaven and is seated at the right hand of the Father. He will come again in glory to judge the living and the dead and his kingdom will have no end. I believe in the Holy Spirit, the Lord, the giver of life, who proceeds from the Father and the Son, who with the Father and the Son is adored and glorified, who has spoken through the prophets. I believe in one, holy, catholic and apostolic Church. I confess one baptism for the forgiveness of sins and I look forward to the resurrection of the dead and the life of the world to come. Amen.